"This chili is delicious. Add whatever amount of seasonings your family enjoys, and also add extra vegetables like zucchini and carrots if you want. Please make and enjoy -- I know you will!" Place turkey and bell pepper in a large saucepan over medium heat, and cook until turkey is evenly brown. 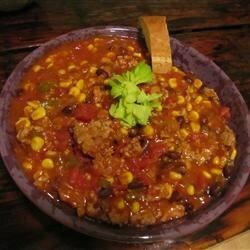 Mix in beans, tomatoes, and corn. Season with cumin, chili powder, red pepper flakes, and cinnamon. Bring to a boil, reduce heat to low, and simmer 30 minutes. Add water if you want a more liquid chili.